I am both shocked and delighted to welcome a very special guest for Drop-Dead Denim today. I am also finding it quite difficult to capture this “Nancy Minsky” in a few introductory lines. It’s virtually impossible. But… I can’t not try, right? So here goes! Originally from Portland, Oregon, a nucleus of art and craft, Nancy Minsky has had a life-long love affair with her sketchbook. Her innate need to produce art at every turn has led her to study a spectrum of art media from pottery to calligraphy to fashion, under a host of gifted teachers at numerous prestigious art and design schools including The Parsons School of Design in New York City. To name a few, she worked at the Metropolitan Museum of Art alongside the great Diana Vreeland, was encouraged by Geraldine Stutz of Henri Bendel, and nurtured by Calvin Klein himself. She is an artist. She is a clothing designer. And she knows a teensy bit about old blue jeans having authored the book “Denim Revolution” and the blogs 21st Century Dressmakers and Jean Repair. Warmly welcome Ms. Nancy Minsky! Unlike any other piece of clothing, blue jeans have this uncanny ability to live nine lives. They just adapt naturally to every spin and turn from childhood though adulthood. They make a statement about our individualism, our freedom, and our choices in life. We love our jeans like we love rock-n-roll, apple pie and long weekends. They start new, become old, need mending and patching, and finally morph into charming recycled crafts. 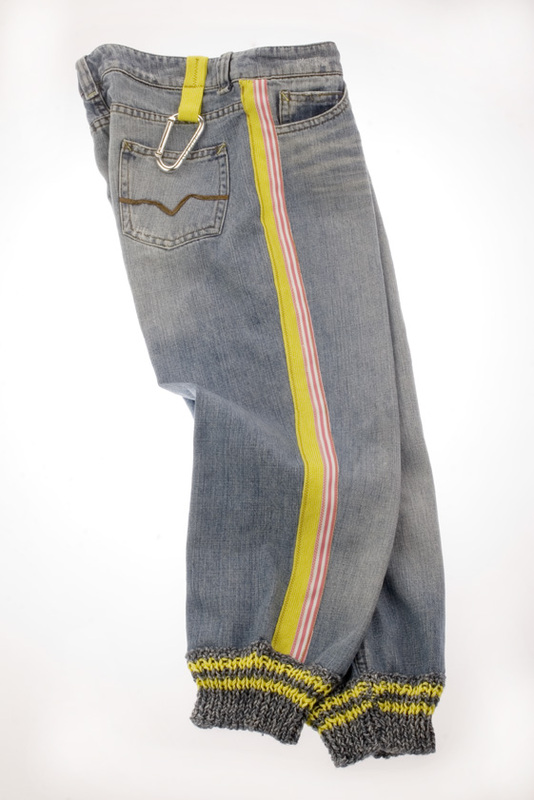 A pair of jeans travels a long journey filled with many fun and surprising paths. That journey begins as a “new” and prized possession – no matter if they were acquired as a pricey must-have or simply a hand-me-down. As they wear, they seamlessly evolve, their texture and color growing softer, more comfy, familiar and cozy, beginning another life, that’s like a well-traveled best friend. The soft cotton yarn used to weave the denim eventually wears terribly thin with the washing and hard wearing, and holes and loose threads appear gradually, and then profusely. So, ultimately, with the passage of time, even a most favorite pair will end up forgotten and lost somewhere in the back of a closet. But one day, unexpectedly, those “old” jeans catch our glance as we rummage around in the back of that closet… and instantly, the true blue jean memory flashes forward. A stream of wistful associations pours out about those long forgotten old blues – of events, places, or people – from a decade ago, from high school, or when you were another shape. Old blue jeans are the stuff of legends, and each of us has a unique and special story to muse over. Filled with those memories and expectations you contemplate how to mend those old blues and a life begins anew. As you gently coax and churn your humble old jeans, with thought, sewing skills and integrity, improved and more durable “new” jeans are created. All you need to mend and patch jeans is some industrious sewing, the proper tools and lots of tender loving care. Mend your jeans with integrity – be true to your philosophy about your style and what appeals to you, or what scraps you have in your fabric bin. Mend them with skill – you need your stitches to be as durable and beautiful on the inside as on the outside. HERE are some useful sewing techniques about mending jeans. 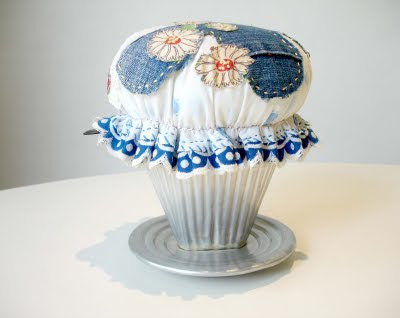 And HERE is another link for those truly old and ragged jeans. HERE are some general tips and details about hemming jeans on Scribd. But if the fit of those jeans just doesn’t cut it any longer, then give them an altogether new life and crop and trim them like joggers. 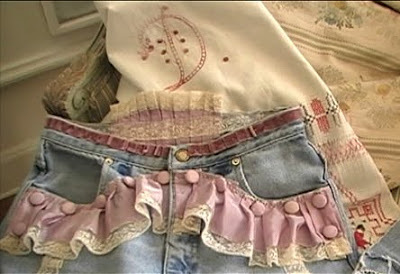 Or re-invent them into a poufy jean skirt (Denim Revolution project). 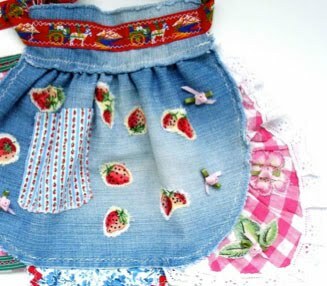 Or an apron for a little girl. Dear Blue Denim knows no limits and adapts magically to every whim with style. One never tires from stitching this beautiful fabric. 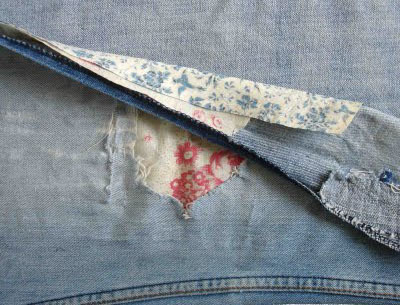 It’s simply not a coincidence that old jeans live nine lives… and more! Thank you Michele for your beautiful artistry, for your inspiration and for inviting me to participate in your month devoted to the true blue. Happy Denim Month to all! Thank YOU Nancy for being here. Wow! And also thank you for acknowledging our efforts to play and sew with old denim and our attempts to spread that excitement and fun across the Ether. It’s been a huge honour and a joy having you. In fact, my door (or is it a portal?) is always open. Visit again anytime! 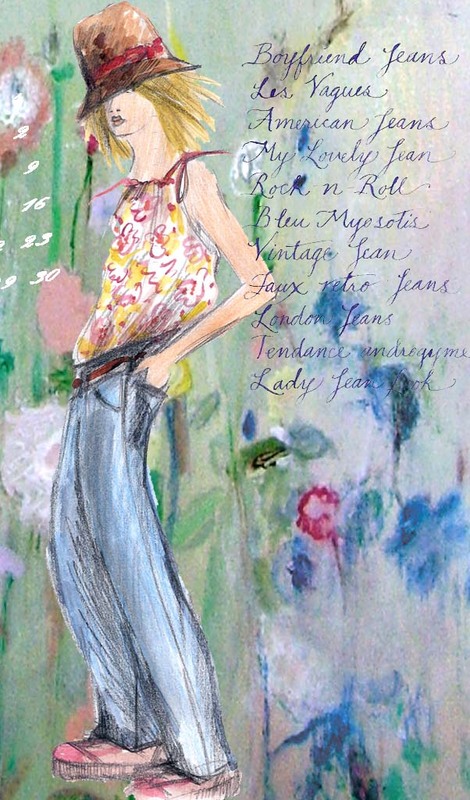 Oh and by the by, Denim Revolution by Nancy Minsky is reviewed HERE by me. Today I’m Diggin’ This Denim: The entire post above, by gum! You have a lovely day, won’t you? I’ll see you again soon! Love the joggers! I have had Nancy's book for sometime. Some lovely photos for sure. Also, recycled denim is easily my favourite material to work with so this entire series (Which I just discovered today) has me excited. Great posts! 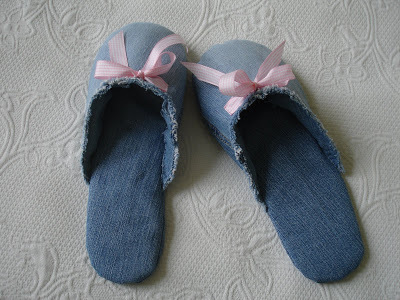 I only wish I knew sooner as I have a slew of denim projects. Looking forward to seeing what caps off September! What great ideas. I have a pile of jeans that need some love…maybe this weekend! I love the slippers!!!! So cute!! Since denim costs 10 / yard at the craft store, I definitely recycle as many pair of jeans as possible. This has been such an inspiring post!! I was thinking the same thing as Little Treasures, this is such an inspiring post. And I really want to make those slippers. 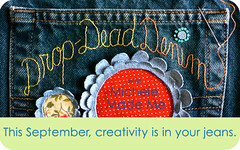 Yes a lovely post full to the brim with denim inspiration! Thanks for the introduction! Love the sewing pocket quilt! Neat idea. The slippers are just my style…love those.